SparkLabs, an accelerator program in South Korea that is bringing a Silicon Valley-like approach to the Asian country’s startup ecosystem, showcased its second batch of startups to investors at Demo Day today. SparkLabs belongs to the Global Accelerator Network, which includes Techstars, Australia’s PushStart and Microsoft’s Azure accelerator in Israel. The businesses that the accelerator favor all aim to go beyond Korea’s traditionally inward focus, and move into lucrative markets including the US, China, Japan, and others. To fit its overseas ideals, SparkLabs boasts an impressive line-up of advisers and mentors — and a dozen more have joined recently, including Sang Cha, who built one of software company SAP’s core platforms, as well as Spindle’s Pat Kinsel who recently sold his company to Twitter, and Ty Ahmad-Taylor, who is Head of Smart TV Services at Samsung. The company behind MemoZy, which has been the App Store’s number one productivity app in 12 countries. It recently moved to a registration-based service with a new “Timeline” feature. An example of a targeted social network. The company is behind a social marketplace for baby items, which lets mums connect, share and browse all types of baby products. Selling premium organic breads from local bakeries via an online platform is what this startup does. It delivers fresh bread from handpicked bakeries to customers every morning. Another food-related startup. 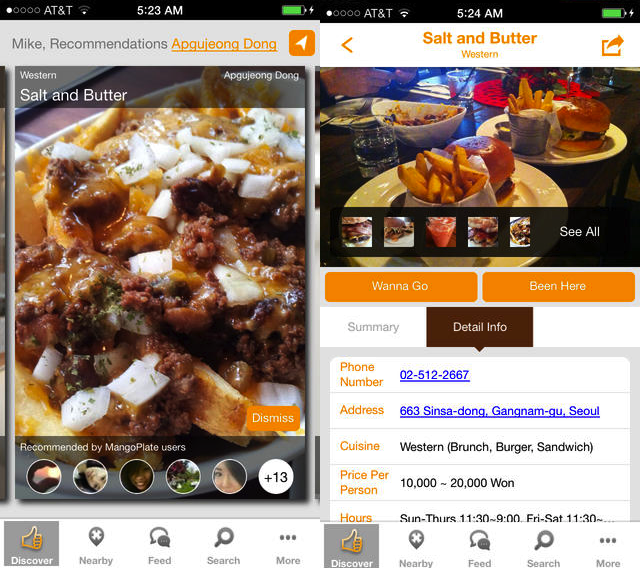 The MangoPlate app is a restaurant discovery service for South Korea’s capital city Seoul, which will help users find restaurants based on recommendations from a network of people. Yet another targeted social network, but with an added knowledge platform. The app caters to fashion enthusiasts, collecting fashion knowledge to help people share and discover related information. The company behind search platform COGO, which automates search sessions — retrieving, indexing and organizing search data into a visual format. This startup is behind a product called Walk Analytics, which gives insights to offline business such as foot-traffic, the duration of a stop at any shop, and engagement data. The company is launching a social investment platform for equities. Users get a phantom cash allocation to kick-start their investment track record, do their research via library resources, and can possibly execute real trades. It will be interesting to see how these startups fare, especially outside of South Korea, in the coming months — as investors decide on their interest level in the companies’ ideas that have been pitched.